James Blair, Anglican missionary. Lived from about 1655 to 1743. He worked as a missionary to the Colonies of Virginia. Over the period of his life he started and ran a college "College of William and Mary", rebuilt the school after a fire; housed an Indian school, chapel, library, and president's house; drafted the first college statutes; hired the first full-time faculty; and transferred the original charter to the president and masters. As I studied the life of James Blair he struck me as a man with strong ideas and the will to see them through. Fight he would when the time was right and no backing down either. He wanted a school and when the first was destroyed he managed to get another one. He argued and discussed until he accomplished. There are two frames of thought about Blair. One that he picked battles with folks and therefore alienated people, and the other that he set out to provide school for the colonists and succeeded, wanting only the best. He did tend to side with the laity (people of the church) rather than with the clergy. This caused enmity among the clerics. His strong opinions and unwillingness to back down was both a thorn in his flesh and a boon. It helped him to stick through battles so he could rebuild his school and face up against opposition, but at the same time, it caused hard feelings among his peers and made his job more difficult to do. He did accomplish his task of reviving and reforming the church in colonial Virginia. I have been buying premade quesadilla, telling myself I need to learn to make them myself. Tonight I decided to﻿﻿ look up a recipe﻿﻿ and said "DOH! If I had known they were THIS easy to make I would have been making them myself ages ago." Leftover salmon steak flaked up. MOM! Can you make me one.. just with cheese! 20 minutes later.. Hun.. mind if I use a wrap? I foresee more quesadillas in our future. What about you??? Quiet with the sounds of sleeping men. One Husband, One Son, One Visiting Student. That silence is not a given. Sometimes I crave time just for me. And then I realize how selfish that is. Around me people are struggling. To meet that need, albeit sometimes poorly. My desire to not always be needed? Well, God will meet that need. Days of not feeling well. In order to let my body heal. Not always an easy thing. A Student's delight in experiencing new things. Life can be alone and silent. I am truly.. never ALONE. Write unedited for five minutes on a given word prompt. This prompt is provided by dear Miss Kate. If you haven't already guessed, today's word prompt is ALONE. THEN.. You take the time to be part of the heart of this community and you ENCOURAGE the person, or persons who linked up before you. I don't know if any of you know about the Donnelly's. I first learned about them when I was in my early teens. The book made in impression on. Irish families. Area in turmoil. Murder at hand along with a complicit constable. The Donnelly family virtually wiped out in a single night. My son was of an age where he could learn about this part of our local history, so when we needed to make an unexpected trip into London, I took advantage of the time and stopped in at the Lucan Museum on the way there. I did not know it did more than tell the story of the Donnelly's, but also of the local black settlement. We started our tour watching a video about the Donnelly's and their history. They came from the Tipperary part of Ireland. An area known for it's rough people. The Donnelly's did not change their ways when they arrived in Canada. They were a rough living family that frequently skirted the law. They wanted land, but couldn't afford it, so simply squatted on a piece of land and called it their own. They frequently quarreled with their neighbours. If trouble were to found they were bound to be in the midst of it, but as people are, they were no different from many of their neighbours. There are a lot of discrepancies in the stories surrounding the Donnelly's from the date they arrived to just how events transpired that resulted in their deaths. The museum had some facts, this website has others. Suffice it to say, Mr. Donnelly was not a man to back down from a fight, and he'd do whatever he could to come out on top.... even if that meant murder. As events went, a Catholic Priest was called into the area after the old one passed. This priest took a strong disliking to the Donnelly's and wanted them gone. He formed a group of men with the intention of settling the region down (which meant settling the Donnelly's down). A constable came into the back door of the Donnelly house and handcuffed the strongest fighter of the Donnelly lads and then let in the rest of the gang. The Donnelly family (save a daughter and visiting 11 year old lad) were beaten to death. At the museum we were told the lad and the girl both lived but the website says the girl Bridget died. Which is true I don't know. At the household of another Donnelly family the first Donnelly to answer the door was also shot to death, the rest stayed quietly in the house as the gang did not know that more were there visiting. The house was burnt to the ground. NONE of the perpetrators were brought to justice and the Donnelly family was just gone. People killed, murderers staying free. It is an horrific tale regardless of what all the facts are. It is a sad part of our history. We learned that one of the things the Irish liked to do for fun was hit each other with Sticks with knobs on them. These were for the lads to use, the lasses would use socks laden with rocks. It was just part of what they did. That information helps me to understand the violence these Irish folk lived under. I found it deplorable that a constable would take part in the murder of a family (handcuffing the fiercest fighter of the family, and going in the backdoor to do so). AND that a priest would get his back up and form a group with the purpose of getting rid of the Donnelly family. Just not a good thing that. The rest of the museum (the main part) not the outbuildings, was about the black settlement. They had quite a few displays set up. Here is one of them. Out back they had a house, NOT the Donnelly house (as it burned to the ground), but a house of a similar style. It was interesting to go in. They even had a bedstead of a similar style. So my son could hide back under the bed just like the lad in the Donnelly killings. My son said.. "I would have put a lot of stuff in front of me so no one could see and would have been so very quiet mom". My lad, almost the same age as the lad in the tale from time past. What a horror for that lad to live with. I am not so sure that I would have a less sensitive and young child go through the Donnelly museum, but it was interesting, And opened my son's eyes to how grudges can spill over into some nasty business. Have you seen these yet? My son and I were so amazed. I am constantly amazed at the creativity that God placed with us. From making painting, carvings, statues, and more...and now even in the rice... Creativity abounds! I went looking for more pictures online and came up with this video. Want to learn more about American Composers? Want lessons that are ready made? Like to like to music? Really? So do I! And so today I bring you a delight... Music for your ears, and learning for your students. Gena Mayo of I Choose Joy has put together 21 Lessons in 2oth Century American Music Appreciation. Imagine sitting down with your children wanting to teach them a few things about their musical heritage or at least some of the music that you might have a firm appreciation for). :) I happen to LOVE ragtime music...makes my feet want to move. :) I just happened to have at my fingertips a wonderful ebook that allowed me to easily share that love with my lad. His response... I LIKE IT. Can we listen to more mom? We spent the next hour listening to various pieces of ragtime music and listening for the difference between it and Stride Piano. We both prefer the original ragtime. The piece below is one we listened to. (not linked in the ebook). So just what do you get? You get an ebook of 38 pages covering 21 lessons of composers such as Sousa, Gershwin, Joplin, Bernstein and others. Also types of music such as folk art, jazz and big band. Each Lesson gives you links to videos and sites such as Classics for Kids. You are given an introductory look at each composer. This is not meant to be an in-depth look at all these composers, it is meant to give you an introduction to them and a good sampling of their music to inspire you to go on. Just doing the basic lesson took us perhaps 20 minutes, but we had fun looking at other music by the composers. So you can easily make this lesson as long or short as you like, and you can include students from kindergarten all the way up through highschool. Pretty cool eh? Even better.. it's on sale right now. Use the code August50 and you save half price. 21 lessons...that will cover a GOOD part of your year if you do one lesson a week. This is what we plan to do. click to buy, coupon code August50. Save 50%. My blue Infusion Tea Pitcher. I LOVE IT. I do! So just how does one use this tea pitcher? Twist the tea infuser into the top part. As I do this I have filtered water pouring into the pitcher. So that would be step three technically, but really I call step three screwing the infusor into the holder. It fits tight so you have no leakage of random tea bits (the bane of other infusion methods I've tried). But look what happens when you let it set for a spell. If you put it out in the sun it goes faster, and for a sweeter tea mix somehow makes it taste even better. BUT for a "i'm not sure what this is tea" setting it on your counter works really well. Rinse a few times and voila! See how clean it is? I sweeten my tea with a touch of spenda, unless I have a cold then I add lemon and honey and warm it up. How do you do your tea? A+Tutorsoft MATH SALE Only... $12!!!! 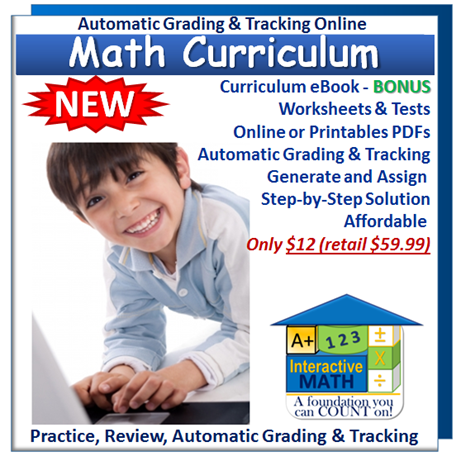 You really don't want to miss out on it if you are looking for a good math program for your children. So click on the image below and save on your math program today! Normally $59.95, now only $12 for the entire year. Over this past week I've been busy.. so has the whole family. My hubby with struggling to feel well as he's fighting some type of bug. My lad in keeping up with his mom. :) We've been gone from the home TOO many days and it kind of caught up to us today...so we had a relaxing day just fiddling at home. So what all have we been doing? I've been a tough mom this week too.. making him work on his Veritas Press course as well. He enjoys it but we got diverted too much last year, so he's got some catching up to do. :) He's doubled up most days this week except when he was working hard helping mom clean the house. We needed to make an unexpected EXTRA trip into the big city this week so I chose to make a detour at one of our local museums. We went to the Donnelly Museum and spent about an hour there. The Donnelly Museum is part of the Lucan Heritage Museum. Half is devoted to the Donnelly Story, the other half to the Black Pioneer Village. Interesting place, I'll be doing up a separate post for it. Here the boys are checking out the difference in the map from the Donnelly Days to today. In all my spare time I cleaned our school room. This room is the dumping ground for everything we don't know where else it goes at the moment. So it gets tools, and paper and books and all kinds of interesting stuff dumped in it, and then I get fed up and clean it out. Took me quite a while to get it done this time, usually one day of concentrated effort gets the job done, this time it took three... but part of that was due to the "hmm, where can I put the stuff from the guest room"???? I finally figured out putting a book shelf in the lad's room was the answer, which meant the Lad's room needed a thorough cleaning. And since that wasn't done well since end of May... it was a fair effort as well. The biggest stressor for my boy was that his snake skins remain undisturbed. So on one side we have the snake skins, then a book shelf, and pictures on the wall. Our book shelf has a rather unique placement (on top of a storage unit). But it's all good, the lad is happy and I'm happy too! AND all my lad's creative element stuff is safely ensconced in the book room. So our guest room is ready for our Brazilian student, our book room is mostly ready AND the bonus of having my son's clean as well. Job well done for a week eh? BUT our week was NOT over!! Yesterday was the Zurich Bean Festival. Our here LOTS of white beans are grown and one of the local towns hosts an annual festival. The highlights for my guys are two fold.... the classic car show and the frog jumping competition. Get down and yell JUMP! and the frog 9 times out of ten will jump! My lad's frog came in about 10th of 30 children. They had lots of neat cars there. Here's my hunny checking out a corvette. Today I needed a relaxing day at home, so after church this morning, instead of making a trek out to the Pinery for lunch and a swim or walk, we stayed close to home. I was feeling a bit "off" so tried reading for a while, tried resting for a while but was feeling to jittery overall for that.. so I cleaned the kitchen cupboards. I KNOW I KNOW.... as my mother would say "OP SUNDACH!!!" (ON Sunday!!!!). But my cupboards are clean, my family is blessed and I no longer feel jittery. I don't think that God will be disheartened by my working on the Sabbath day. I even made myself some tea and yes.. I've a post coming on my favourite tea maker too!